ABSL Resurgent India Fund Series 7 – NFO has been launched to invest in and gain from the rural growth. 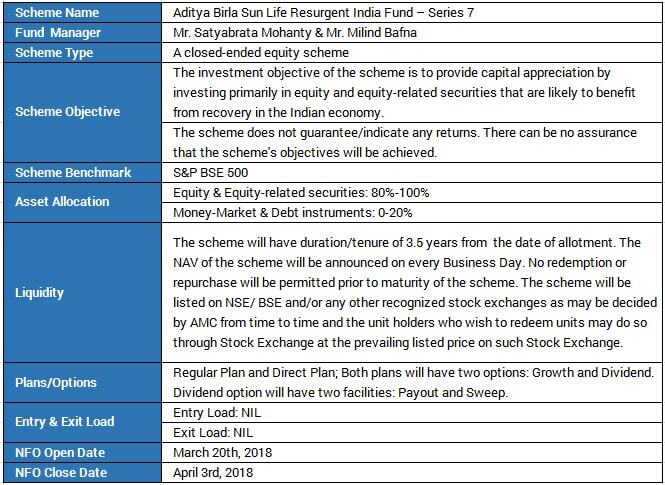 In continuation of the Resurgent India Series, Aditya Birla Sun Life Mutual Fund (ABSL Mutual Fund) has released a new NFO of the 7th edition under the name of Aditya Birla Sun Life Resurgent India Fund Series 7. With the similar motive of participating in the transformation of rural India to generate wealth, the fund house has launched the NFO today, i.e., on 20th March, 2018. In congruency with Series 6 fund, the series 7 fund is a thematic equity scheme diversified across the sectors contributing towards the development of rural economy. The entire Indian money market is visualizing the macroeconomic sectors to be the highest growth areas in the future. An approximate of 15% CAGR from the agriculture sector and increment of USD 650 billion in the GDP from the rural economy have compelled the fund house to extend this series and invest in this direction. The fund house has worked skillfully to diversify the fund’s portfolio such that the allocation concentrates on the Government’s areas of interest. With the increased focus of the latest Budget policies on rural development along with technological advancements, the fund has chosen to invest in the high yielding farm and non-farm production areas. 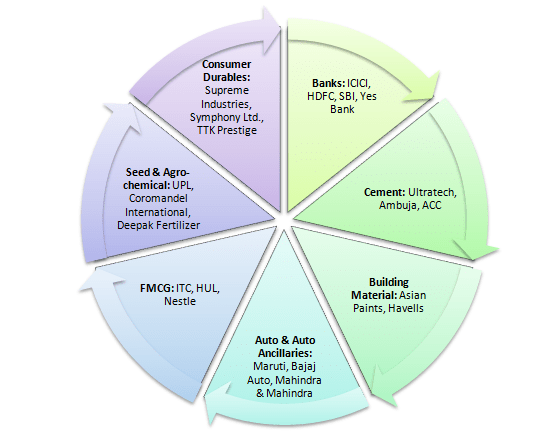 The bottom-up investment style of the fund management team picks up the companies from the sectors such as finance, auto and auto ancillaries, building materials, seed & agro-chemical, consumer durables, cement, FMCG, and others. They have not only been consistent performers in the past, but are anticipated to be among the prominent ones in the coming future. The differentiated investment approach has exposure to around 50-60 stocks which has been selected after carrying out rigorous fundamental research. The fund has a multi-cap orientation with 35-50% exposure to large-cap companies emphasizing to gain benefits from the rural growth. The stocks are selected on the basis of the parameters including the expected growth in earnings, rerating prospect, scalability, and reach of the business. The fund has prioritized its selection strategy in such a way that the investors can take advantage of the sectors benefitting directly or indirectly from the rural growth. The investment in macroeconomic areas will contribute to a rise in rural income and subsequently excessive and richer consumption. This will ultimately act as a catalyst for the growth of the overall economy and the invested capital will come back to the investors in the form of capital gain. With the launch of this fund, ABSL Mutual Fund has clearly indicated its motto of participating in India’s shift towards urbanization. The AMC wants to urge investors to be a part of the value chain of all benefitting industries and drive the consumption and investment trends in India for the better future. For more details on new NFOs like ABSL Resurgent India Fund, mutual fund performance and other information, keep visiting MySIPonline.